The Gaia hypothesis is a class of scientific models of the geo-biosphere in which life as a whole fosters and maintains suitable conditions for itself by helping to create a favorable environment on Earth for its continuity. The Gaia hypothesis was developed by atmospheric scientist and chemist Sir James Lovelock. He formally published the concept first in the New Scientist (February 13, 1975) and then in the 1979 book Gaia: A New Look at Life on Earth. Lovelock hypothesized that the living matter of the planet functioned in many ways like a single self-regulating organism, which he named after the Greek goddess Gaia, following a suggestion from novelist William Golding. The Gaia hypothesis addresses the remarkable harmony seen between biotic and abiotic elements on Earth. Noted microbiologist Lynn Margulis, who has been an important collaborator with Lovelock in developing Gaian concepts (Turney 2003), sees the history of life as having developed more by cooperation than by competition (see Endosymbiotic theory). Another way of viewing the evidence of harmony highlighted by the Gaia hypothesis, is as a reflection of the intrinsic interdependence among elements of living systems, in which an organism's identity is tied to its relations with other organisms, and its individual purpose—oriented toward the preservation, development, and multiplication of the self—is integrated with a whole purpose of contributing to the development and preservation of the larger whole. Gaia "theories" have non-technical predecessors in the ideas of several cultures. Today, "Gaia theory" is sometimes used among non-scientists to refer to hypotheses of a self-regulating Earth that are non-technical but take inspiration from scientific models. Among some scientists, "Gaia" carries connotations of lack of scientific rigor and quasi-mystical thinking about the planet Earth, and therefore Lovelock's hypothesis was received initially with much antagonism by much of the scientific community. No controversy exists, however, about the fact that the biosphere comprising life on earth and the physical environment is a complex ecosystem with life and the physical environment influencing each other in often complex feedback loops extending over multiple different time scales. The original Gaia hypothesis has split into a spectrum of hypotheses, ranging from the undeniable (Weak Gaia) to the radical (Strong Gaia). At one end of the spectrum is the undeniable statement that the organisms on the Earth have radically altered its composition. A less limited position is that the Earth's biosphere effectively acts as if it is a self-organizing system, which works in such a way as to keep its systems in some kind of meta-equilibrium that is broadly conducive to life. The history of evolution, ecology and climate show that the exact characteristics of this equilibrium intermittently have undergone rapid changes, which are believed to have caused extinctions and felled civilizations. Biologists and earth scientists usually view the factors that stabilize the characteristics of a period as an undirected emergent property or entelechy of the system; as each individual species pursues its own self-interest, for example, their combined actions tend to have counterbalancing effects on environmental change. Opponents of this view sometimes point to examples of life's actions that actually have resulted in dramatic change rather than stable equilibrium, such as the conversion of the Earth's atmosphere from a reducing environment to an oxygen-rich one. However, proponents will point out that those atmospheric composition changes created an environment even more suitable to life. Some authorities observe the global equilibrium of abiotic and biotic components and see it as a natural harmony stemming from cooperation, more so than competition. For example, Margulis holds that "Life did not take over the globe by combat, but by networking," that is, for complex and robust ecosystems to have emerged the phenomenon of organisms working together must have overshadowed the phenomenon of organisms "red in tooth and claw" competing. The philosophical concept of dual purposes similarly sees cooperation as the underlying principle between the evident harmony. An organism's individual purpose is seen as manifested by its concern with the self-preservation, strengthening, development and multiplication of the self. A purpose for the whole is one whereby the individual contributes to the preservation and development of the whole. These two purposes are seen as working together in harmony, being interdependent, such as the way that a cell in the body produces useful products for the body, while preserving its own self, and being supported in its survival by the body. Beyond the concept of a "self-organizing system," a more radical Gaia hypothesis is that all lifeforms are part of one single living planetary being called Gaia. In this view, the atmosphere, the seas and the terrestrial crust would be results of interventions carried out by Gaia through the coevolving diversity of living organisms. 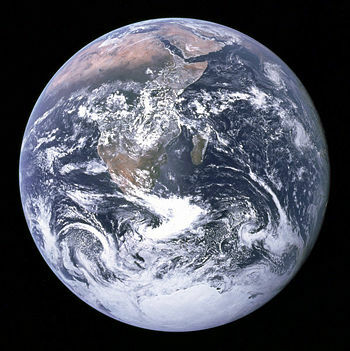 While it is arguable that the Earth as a unit does not match the generally accepted biological criteria for life itself (Gaia has not yet reproduced, for instance; it still might spread to other planets through human space colonization and terraforming), many scientists would be comfortable characterizing the earth as a single "system." The most extreme form of Gaia hypothesis is that the entire Earth is a single unified organism; in this view the Earth's biosphere is consciously manipulating the climate in order to make conditions more conducive to life. Scientists contend that there is no evidence at all to support this last point of view, and it has come about because many people do not understand the concept of homeostasis. Many non-scientists instinctively see homeostasis as an activity that requires conscious control, although this is not so. Much more speculative versions of Gaia hypothesis, including all versions in which it is held that the Earth is actually conscious or part of some universe-wide evolution, are currently held to be outside the bounds of science. Also outside the bounds of science is the Gaia Movement, a collection of different organizations operating in different countries, but all sharing a concern for how humans might live more sustainably within the "living system." Optimizing Gaia. A version of strong Gaia hypothesis called "Optimizing Gaia" asserts that biota manipulate their physical environment for the purpose of creating biologically favorable, or even optimal, conditions for themselves. "The Earth's atmosphere is more than merely anomalous; it appears to be a contrivance specifically constituted for a set of purposes" (Lovelock and Margulis 1974). Further, "...it is unlikely that chance alone accounts for the fact that temperature, pH, and the presence of compounds of nutrient elements have been, for immense periods, just those optimal for surface life. Rather, energy is expended by the biota to actively maintain these optima." Omega Gaia. Another strong hypothesis is the one called "Omega Gaia." Teilhard de Chardin claimed that the Earth is evolving through stages of cosmogenesis, affecting the geosphere, biogenesis of the biosphere, and noogenesis of the noosphere, culminating in the Omega Point. Influential Gaia. The weakest form of the Gaia theory has been called "influential Gaia." It states that biota barely influence certain aspects of the abiotic world, e.g. temperature and atmosphere. Weak Gaian hypotheses suggest that Gaia is co-evolutive. Co-evolution in this context has been thus defined: "Biota influence their abiotic environment, and that environment in turn influences the biota by Darwinian process." Lovelock (1995) gave evidence of this in his second book, showing the evolution from the world of the early thermo-acido-phyllic and methanogenic bacteria towards the oxygen-enriched atmosphere today that supports more complex life. The weak versions are more acceptable from an orthodox science perspective, as they assume non-homeostasis. They state that the evolution of life and its environment may affect each other. An example is how the activity of photosynthetic bacteria during Precambrian times have completely modified the Earth's atmosphere to turn it aerobic, and as such supporting evolution of life (in particular eukaryotic life). However, these theories do not claim the atmosphere modification has been done in coordination and through homeostasis. His initial hypothesis was that the biomass modifies the conditions on the planet to make conditions on the planet more hospitable—the Gaia Hypothesis properly defined this "hospitality" as a full homeostasis. Lovelock's initial hypothesis, accused of being teleological by his critics, was that the Gaia atmosphere is kept in homeostasis by and for the biosphere. Since life started on Earth, the energy provided by the Sun has increased by 25 percent to 30 percent; however the surface temperature of the planet has remained remarkably constant when measured on a global scale. Furthermore, he argued, the atmospheric composition of the Earth is constant. The Earth's atmosphere currently consists of 79 percent nitrogen, 20.7 percent oxygen and 0.03 percent carbon dioxide. Oxygen is the second most reactive element after fluorine, and should combine with gases and minerals of the Earth's atmosphere and crust. Traces of methane (at an amount of 100,000 metric tons produced per annum), should not exist, as methane is combustible in an oxygen atmosphere. This composition should be unstable, and its stability can only have been maintained with removal or production by living organisms. Ocean salinity has been constant at about 3.4 percent for a very long time. Salinity stability is important as most cells require a rather constant salinity degree and do not tolerate much values above 5%. Ocean salinity constancy was a long-standing mystery, because river salts should have raised the ocean salinity much higher than observed. Only recently have we learned salinity is controlled by seawater circulation through hot basaltic rocks, and emerging as hot water vents on ocean spreading ridges. Lovelock sees this as one of the complex processes that maintain conditions suitable for life. The volcanoes make the CO2 enter the atmosphere, CO2 participates in limestone weathering, itself accelerated by temperature and soil life, the dissolved CO2 is then used by the algae and released on the ocean floor. CO2 excess can be compensated by an increase of coccolithophoridae life, increasing the amount of CO2 locked in the ocean floor. Coccolithophoridae increase the cloud cover, hence control the surface temperature, help cool the whole planet and favor precipitation, which is necessary for terrestrial plants. For Lovelock, coccolithophorides are one stage in a regulatory feedback loop. Lately, the atmospheric CO2 concentration has increased and there is some evidence that concentrations of ocean algal blooms are also increasing. The Gaia Hypothesis is based on the simple idea that the biomass self-regulates the conditions on the planet to make its physical environment (in particular temperature and chemistry of the atmosphere) on the planet more hospitable to the species that constitute its "life." The Gaia Hypothesis proper defined this "hospitality" as a full homeostasis. A simple model that is often used to illustrate the original Gaia Hypothesis is the so-called Daisyworld simulation. Whether this sort of system is present on Earth is still open to debate. Some relatively simple homeostatic mechanisms are generally accepted. For example, when atmospheric carbon dioxide levels rise, plants are able to grow better and thus remove more carbon dioxide from the atmosphere. However, the extent to which these mechanisms stabilize and modify the Earth's overall climate are not yet known. It was very critically received, in particular by Richard Dawkins and Ford Doolittle. These latter argue organisms could not act in concert as this would require foresight and planning from them. They rejected the possibility that feedback loops could stabilize the system. In 1982, Dawkins claimed "there was no way for evolution by natural selection to lead to altruism on a Global scale." They find it impossible to see how the feedback loops, which Lovelock says stabilize the Gaian system, could have evolved. They argue that, as Gaia cannot reproduce herself, she cannot be alive in any meaningful sense. They also claim that the theory is not scientific because it is impossible to test it by controlled experiment. Lovelock offered the Daisyworld model as mathematical evidence to refute most of these criticisms (see below). The initial hypothesis was rather imprecise, and Lovelock later refuted accusation of teleologism by stating: "Nowhere in our writings do we express the idea that planetary self-regulation is purposeful, or involves foresight or planning by the biota" (Lovelock 1990). Another of the largest criticisms against the idea that Gaia is a "living" organism is the inability of the planet to reproduce. Certainly one of the hallmarks of living organisms is their ability to replicate and pass on their genetic information to succeeding generations. Others have proposed that humanity itself is the means by which Gaia will reproduce. Human beings exploration of space, its interest in colonizing other planets, and the large body of science-fiction literature that describes terraforming, lend strong evidence to the idea that Gaia is planning to reproduce. Lovelock responded to criticisms with the mathematical Daisyworld model (1983), first to prove the existence of feedback mechanisms, second to demonstrate it was possible that control of the global biomass could occur without consciousness being involved. Daisyworld, a computer simulation, is a hypothetical world orbiting a sun whose temperature is slowly increasing in the simulation. Daisyworld was introduced by James Lovelock and Andrew Watson to illustrate the plausibility of the Gaia hypothesis in a paper published in 1983. The simulated planet is seeded with two different species of daisy as its only life form: black daisies and white daisies. White daisies have white flowers that reflect light, and the other species has black flowers that absorb light. Both species have the same growth curve (that is, their reproduction rate is the same function of temperature) but the black daisies are themselves warmer than the white daisies and bare earth. A planet with preponderance of white daisies is cooler than one with more black ones. At the beginning of the simulation, Daisyworld is so cold that only a few black daisies, and almost no white daises, can survive. Whenever the planet's temperature decreases, the black flowers tend to predominate, they absorb a little heat from the sun, which causes the planet's temperature to rise, allowing a greater proliferation of black daisies, more absorption of heat, and so on. As the planet becomes hotter, white daisies begin to breed as well, and eventually the planet reaches a point of temperature equilibrium. Any increase in temperature is combated by a greater proportion of white daisies; any decrease leads to more black daisies. Such a system is remarkably stable against varying solar input; the entire planet maintains homeostasis. When the simulation is run without the daisies, the planet's temperature proceeds in synchrony with that of the sun. With the daisies, at the beginning of the simulation there is enhanced warming, and at the end of the simulation enhanced cooling, resulting in a close to equilibrium temperature for most of the simulation. In this way the daisies are modifying the climate to make conditions more hospitable for themselves. However, the Daisyworld system exhibits hysteresis: for some solar constants, the planet has two distinct stable states, typically no life and one almost 100% occupied with life. If the external temperature becomes too cold or too hot, it overwhelms the system. Later extensions of the Daisyworld simulation included rabbits, foxes and other species. One of the more surprising findings of these simulations is that the larger the number of species, the greater the improving effects on the entire planet (i.e., the temperature regulation was improved). These findings lent support to the idea that biodiversity is valuable, and sparked the modern biodiversity debate. Daisyworld has attracted a substantial amount of criticism. It bears scant resemblance to Earth; the system requires an ad-hoc death rate (γ) to sustain homeostasis; and the paper blurs the distinction between species-level phenomena and individual level phenomena. However, Daisyworld arguably demonstrates that biologically mediated homeostasis does not require a teleological explanation. More recently, studies of artificial life using various guilds, of photosynthesisers, herbivores, carnivores, scavengers and decomposers, enables nutrient recycling within a regulatory framework derived by natural selection among species, where one being's harmful waste, becomes low energy food for members of another guild. This research on the Redfield Ratio of Nitrogen to Phosphorus, shows that local biotic processes can regulate global systems (Downing and Zvirinksy 1999). In 1988, the climatologist Stephen Schneider organized a conference of the American Geophysical Union solely to discuss Gaia. The accusations of teleologism were dropped after that meeting. Lovelock presented a new version of the Gaia Hypothesis, which abandoned any attempt to argue that Gaia intentionally or consciously maintained the complex balance in the environment that life needed to survive. This new hypothesis was more acceptable by the scientific community. He supported his new hypothesis with the metaphor of Daisyworld. Using computer simulations of the Daisyworld parameters (no atmosphere, taking into account different albedos (reflectivity) for each daisy type) and a mathematical approach, Lovelock proved that the controlled stability of the climate by life was not being teleological. The new Gaia hypothesis stated that Gaia was homeostatic, i.e. that the biota influence the abiotic world in a way that involves homeostatic feedback. During the Gaia conference, James Kirchner, a physicist and philosopher, took the opportunity of the meeting to explain that there are not one Gaia hypothesis, but several ones ranging from "weak Gaia" to "strong Gaia." He then described five of these: Influential Gaia, Coevolutionary Gaia, Homeostatic Gaia, Teleological Gaia, and Optimizing Gaia. Lovelock, especially in his older texts, has often indulged in language that has later caused fiery debates. What does he mean in the first paragraph of his first Gaia book (1979), when he writes that "the quest for Gaia is an attempt to find the largest living creature on Earth"? How "alive" is that, and in what respect? Is Gaia really an organism? In what sense? And in what sense does the cybernetic system called Gaia seek "an optimal physical and chemical environment for life on this planet"? Optimal for whom? Lynn Margulis, the coauthor of Gaia hypotheses, is more careful to avoid controversial figures of speech than is Lovelock. In 1979 she wrote, in particular, that only homeorhetic and not homeostatic balances are involved; that is, the composition of Earth's atmosphere, hydrosphere, and lithosphere are regulated around "set points" as in homeostasis, but those set points change with time. Also she wrote that there is no special tendency of biospheres to preserve their current inhabitants, and certainly not to make them comfortable. Accordingly, the Earth is not a living organism that can live or die all at once, but rather a kind of community of trust, which can exist at many discrete levels of integration. But this is true of all multicellular organisms, not all cells in the body die instantaneously. In her 1998 book, The Symbiotic Planet, Margulis dedicated the last of the book's eight chapters to Gaia. She resented the widespread personification of Gaia and stressed that Gaia is "not an organism," but "an emergent property of interaction among organisms." She defined Gaia "the series of interacting ecosystems that compose a single huge ecosystem at the Earth's surface. Period." Yet still she argues, "the surface of the planet behaves as a physiological system in certain limited ways." Margulis seems to agree with Lovelock in that, in what comes to these physiological processes, the earth's surface is "best regarded as alive." The book's most memorable "slogan" was actually quipped by a student of Margulis': "Gaia is just symbiosis as seen from space." This neatly connects Gaia theory to Margulis' own theory of endosymbiosis, and the view that life developed by networking and cooperation moreso than by competition. Both Lovelock's and Margulis's understanding of Gaia are now largely considered valid scientific hypotheses, though controversies continue. By the time of the second Chapman Conference on the Gaia Hypothesis, held at Valencia, in Spain on the June 23, 2000, the situation had developed significantly in accordance with the developing science of Bio-geophysiology. Rather than a discussion of the Gaian teleological views, or "types" of Gaia Theory, the focus was upon the specific mechanisms by which basic short term homeostasis was maintained within a framework of significant evolutionary long term structural change. A. "How has the global biogeochemical/climate system called Gaia changed in time? What is its history? Can Gaia maintain stability of the system at one time scale but still undergo vectorial change at longer time scales? How can the geologic record be used to examine these questions? B. What is the structure of Gaia? Are the feedbacks sufficiently strong to influence the evolution of climate? Are there parts of the system determined pragmatically by whatever disciplinary study is being undertaken at any given time or are there a set of parts that should be taken as most true for understanding Gaia as containing evolving organisms over time? What are the feedbacks among these different parts of the Gaian system, and what does the near closure of matter mean for the structure of Gaia as a global ecosystem and for the productivity of life? C. How do models of Gaian processes and phenomena relate to reality and how do they help address and understand Gaia? How do results from Daisyworld transfer to the real world? What are the main candidates for "daisies"? Does it matter for Gaia theory whether we find daisies or not? How should we be searching for daisies, and should we intensify the search? How can Gaian mechanisms be investigated using process models or global models of the climate system which include the biota and allow for chemical cycling?" Tyler Volk (1997) has suggested that once life evolves, a Gaian system is almost inevitably produced as a result of an evolution towards far-from-equilibrium homeostatic states that maximise entropy production (MEP). Kleidon (2004) agrees with Volk's hypothesis, stating: "…homeostatic behavior can emerge from a state of MEP associated with the planetary albedo"; "…the resulting behavior of a biotic Earth at a state of MEP may well lead to near-homeostatic behavior of the Earth system on long time scales, as stated by the Gaia hypothesis." Staley (2002) has similarly proposed "…an alternative form of Gaia theory based on more traditional Darwinian principles... In [this] new approach, environmental regulation is a consequence of population dynamics—not Darwinian selection. The role of selection is to favor organisms that are best adapted to prevailing environmental conditions. However, the environment is not a static backdrop for evolution, but is heavily influenced by the presence of living organisms. The resulting co-evolving dynamical process eventually leads to the convergence of equilibrium and optimal conditions." After much initial criticism, a modified Gaia hypothesis is now considered within ecological science basically consistent with the planet earth being the ultimate object of ecological study. Ecologists generally consider the biosphere as an ecosystem and the Gaia hypothesis, though a simplification of that originally proposed, to be consistent with a modern vision of global ecology, relaying the concepts of biosphere and biodiversity. The Gaia hypothesis has been called geophysiology or Earth system science, which takes into account the interactions between biota, the oceans, the geosphere, and the atmosphere. Downing, K., and P. Zvirinsky. 1999. The simulated evolution of biochemical guilds: Reconciling Gaia theory and natural selection. Artif. Life 5:291–318. Kleidon, A. 2004. Beyond Gaia: Thermodynamics of Life and Earth system functioning. Climate Change, 66(3): 271-319. Lovelock, J. 2000 . Gaia: A New Look at Life on Earth. Oxford University Press. Thomas, L. 1974. Lives of a Cell. Bantam Books. This page was last modified on 5 July 2008, at 15:00.